This beautiful jade piece has a bat biting the coin. The bat is called "fu" in chinese which carries the meaning good luck and good fortune. The symbol of bat biting a coin implies "everlasting fortune and love just in front of your eyes" and resembles long life, excellent relationship, happiness and good luck. The bat enhances wealth, prosperity, happiness energy and realize smoothness in our endeavour. Giving this pendant to your loved ones will harness good love life and excellent fortune to the recipient. Also great for birthdays and seasonal celebrations. This pendant comes with a free necklace and a free gift box. This pendant is suitable for both male and female. On the other hand, jade is believed in feng shui to be the link between man and the heaven and is called the "stone of heaven" during ancient times. 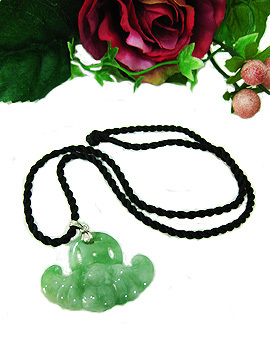 Jade gives impression of delicate gracefulness, elegance and exquisiteness. Widely used in esteemed arts and crafts from 18th century till today, jade embodies perfection, immortality, and is a symbol of love, fidelity, virtue, generosity, wealth and nobility. 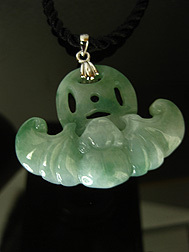 Jade promotes good health, protection against losses and good fortune. The jade had saved many lives too. In times of danger, such as when the owner of a piece of jade meets with an accident, the jade would break into pieces to take away the danger and save the owner's life. Or out of no good reason a piece of jade is broken or by accident, it simply means it had taken away some danger that you could encounter on that particular day.